Artist Han Jeong-sun’s exhibition “Untamed Thoughts” showcases her allegorical paintings, which deal with wildness and breaking free of constraints, at a local cultural center called The Forest in Nowon, Seoul. In Han’s view, capitalist societies with their repetitive daily routines have deprived contemporary people of their identities and their dignity. She sees contemporary civilization as a force that flattens individuality and represses the beast that is the human spirit. The artist’s paintings show moments of suffering, depression, lethargy, contradictory desires and betrayed hopes. However, Han also emphasizes the importance of recovering the wild aspect of human nature. She says we need “untamed thoughts” -- a phrase taken from French anthropologist Claude Levi-Strauss’ book “The Savage Mind” -- to reflect on ourselves, to think critically and to resist the forces that impose conformity. Her allegorical use of untamable beasts can be understood in such terms. 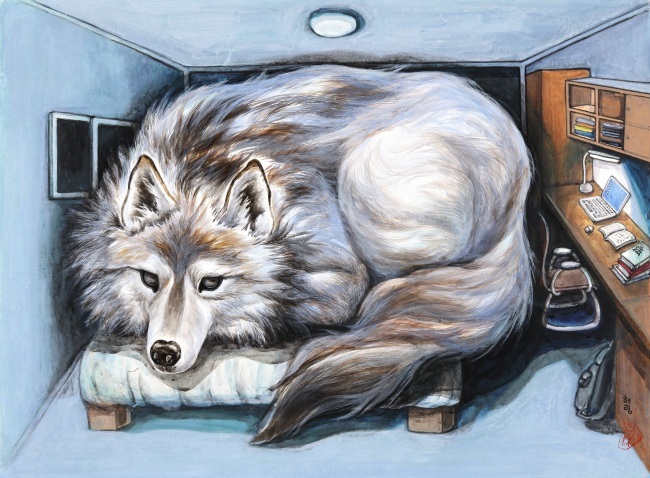 A wolf is a symbol of resistance in her paintings, the artist explained, referring to her 2015 painting “Alice in Wonderland.” The painting, which shows a wolf crammed into a small room, is a kind of artistic document that serves as a witness to the reality of today’s young people, according to the artist. “I hope my drawings become messages of hope and bring a moment of reflection, particularly to the young people here,” Han said. The current run of “Untamed Thoughts” is a continuation of Han’s 2006 exhibition of the same title. It was previously presented in April at the Baekak Art Museum in Insa-dong, Seoul. The exhibition runs through Sunday.